THE STORE LOADS SLOWLY SO PLEASE BE PATIENT. After many years of studying the Dogon religion, Dorey has uncovered the mystery behind its symbols. A mystery that she maintains was stamped out in most places of the world by the Inquisition and the Roman Catholic Church. Dorey explores the key symbols of the Dogon religion, which she believes are from the world's first religion, and which are found throughout the ancient world. She follows the Dogon religious symbols from Old Europe to Japan and from Australia to the Americas to reveal the lost history of humanity. According to the Dogon, the amphibious alien beings known as Nummo are the ancestors of humanity. 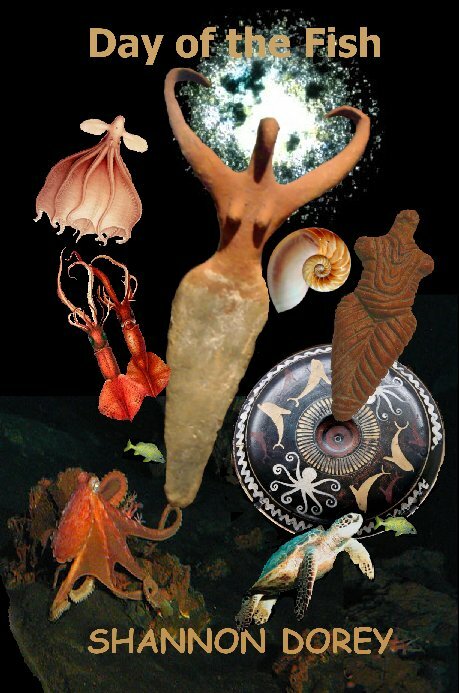 Dorey's book reveals that these hermaphroditic beings, who were identified with the sacred feminine, were the Goddesses known to the people of Old Europe. Dorey feels that it is important for everyone to know about this religion because there is a spiritual component to it that needs to be explored and understood. Dorey feels that current theories that perpetuate falsehoods about history, do not prepare people for the future. To purchase Day of the Fish go to the store. My research reveals that the African Dogon religion is the pagan mystery religion spoken about by the ancient Greeks, Celts, Romans, Egyptians and others, and which was thought to have been lost to humanity. I believe that this religion, still practised by the Dogon people in the 1930s and recorded by the anthropologists Marcel Griaule and Germaine Dieterlen, is the most important historical source document we have left in the world. This document, which records an oral religion that comes from the beginning of human civilization, reveals the truth about our existence. Most of us have spent a great deal of time searching for the truth. This is because we inherently know that there is something missing from our existence. The time I have spent studying the Dogon religion has made me realize just how much of the truth has been taken from us and how new realities have been manufactured that are widely believed in today. I’m not sure how many of you are familiar with George Orwell’s book 1984, but my research on the Dogon has reminded me of that book on more than one occasion. For those of you unfamiliar with the book, it is about a repressive, totalitarian regime that falsifies historical records in order to keep control over society. I believe that our own reality of truth is much like the individuals living in Orwell’s book. The falsifying of our past has been an ongoing process and there have been many culprits along the way. One of the biggest is the Roman Catholic Church, whose oppression of other beliefs has been occurring since 391 CE, when the worship of any religion but Christianity was made illegal in the Roman Empire. In my view, the Dogon people have been the keepers of the truth, a truth that was stamped out in other areas by the Christian crusaders, the Inquisition, and the proselytizing of Jesuit priests around the world.